We are pleased to announce that the 2013 BHA Perth Convention DVDs are now available for sale in our Harmony Marketplace store. 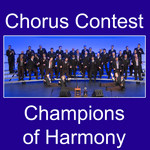 We have two DVDs available: The chorus contest (plus bonus Champions of Harmony concert), and the quartet contest. Click on the link below to order yours now!